With the Boxing Day blizzard in the books as a top 10 storm for most, top 5 for some, we look ahead to a pattern filled with more opportunities for snow/ice across much of the United States. The blocking regime has been the key factor in keeping the Eastern US cold and snowy thus far, muting the strong la nina signal in terms of its effects on sensible weather in our region. Most ninas of the past few decades were warmer, with a storm track much further north; however, the unprecedented solar behaviour (low geomagnetic field) as outlined in the winter outlook has aided in inducing a powerful north atlantic block much of the winter, hence Eastern troughiness. Today we have a mini-event on our hands, as a spoke of energy rotating around the Polar Vortex rolls through. Tomorrow (1/8/11) has the potential to be more interesting, particularly south and east of NYC, due to a coastal low. Model data is still in the process of detecting the potential with this storm, and I believe upwards of 4″ is likely to accumulate in SE NJ, possibly as far north as central NJ and Long Island. The safe call right now is a couple inches in NYC, although there is the possibility of 3-6″ if the coastal low moves a bit closer to the region. Let’s examine the pattern for next week, which has the potential to produce a much bigger, widespread winter storm, from the Plains into the mid and north atlantic states (1/11-1/13). Will it be as severe as the recent blizzard? Guarantees are hard to come by in meteorology, so nothing can be said for certain at this range, but the chances of this event reaching those totals is very, very low. My early read of the potential is a “Significant East Coast Storm” (or “SECS”) event, implying 6-12″ for much of the mid/north atlantic, maybe as far north as New England. I would not be surprised to see MECS totals (12″+); however, that will be outlined as we get closer to the time frame. Notice on the following GFS 500mb panel valid Sunday, we have a strong west based negative NAO block retrograding into north central Canada, a classic position for large height falls underneath, over the SE Unied States (deja vu – very similar upper pattern up north to the Boxing day blizzard). Once this block moves into Canada, the NAO will trend upwards, near neutral, and a rapidly rising NAO modality is an “Archambault” signal for heavy precipitation/cyclogenesis along the East Coast. Another thing to note, as we move into early next week, the Polar Vortex currenting in the Northeast US will exit stage right, leaving behind some confluence, but not enough to shove the event well to the south. We have a severely negative Arctic Oscillation (AO) in place right now, and have much of the winter so far. What this means is there’s a large positive height anomaly, with warmer than normal temps placed over the arctic, due to a very weak/highly disturbed Polar Vortex. This is unusual for most strong la nina seasons, but due to this strong negative AO, the United States storm track has been further south than is typical of nina events, putting the Northeast corridor in the many of the snow jackpot zones. This storm will be no different, as a storm track through the Great Lakes or well inland is VERY unlikely. 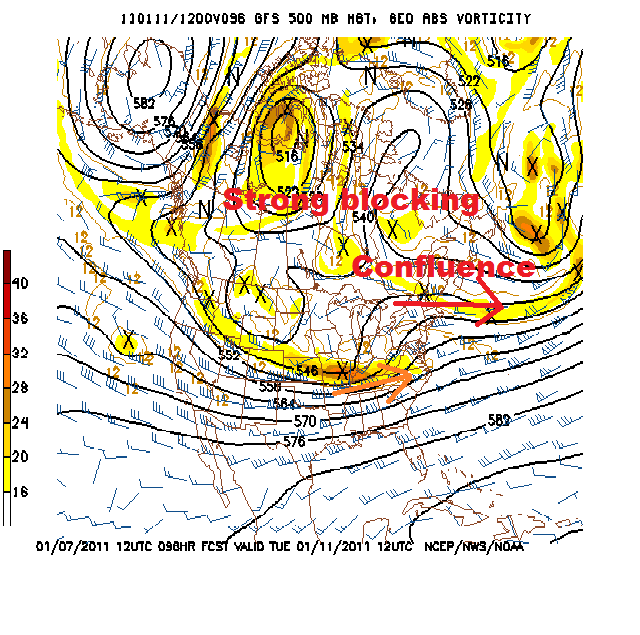 If this event is a miss, it will be too the south, b/c of blocking and confluence across Canada. As one can see from the 500mb depiction, the US flow becomes quite zonal (W-E) next week, indicating the low pressure system should follow the mid/upper flow, propagating from the southern plains to near Cape Hatteras, NC. 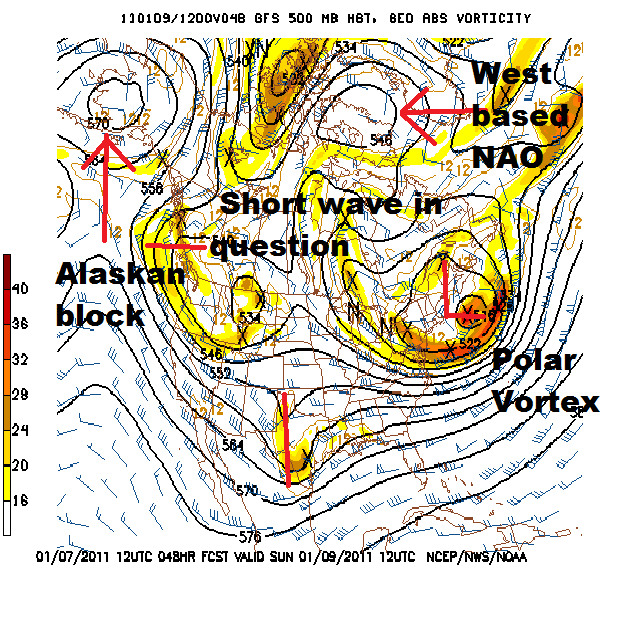 What happens from there is currently uncertain, 1) Will it turn NE up the coast and smash the Northeast with hvy snow? 2) Will it move harmlessly out to sea? Since the 50-50 low will be displaced a bit NE of ideal position, and the confluence trying to lessen over the Northeast, I think the further south we’ll see the snow is VA/MD. In other words, I believe Washington DC area has a very good chance with this storm, probably there best potential of the winter thus far. Philly, NYC, and even Boston, are certainly in the game as well. The pattern doesn’t have as much amplitude w/ the trough/ridges as the blizzard, so I’d say it’s unlikely that this event closes off and produces the insane 2ft+ totals. However, it will be a potent short wave, and a SECS, 6-12″ snowfall is in the realm of possibility, with some spots picking up 12″+ not out of the question. At this point, it looks like another coastal storm, so I-95 S and E will probably be most likely to see those totals IF they occur. Beyond this storm, mid January will turn quite cold, with arctic air pouring into the United States. Global teleconnection indices suggest this is the type of pattern to get virtually the whole country below normal in terms of temperatures. A negative NAO, AO, will ensure that the East stays cold, and a near neutral PNA will ensure that lower heights/cold weather make it into the snow starved PAC NW as well. Coast to coast will be frigid by January 15th-20th, with most of the Plains and Northeast/Mid atlantic likely snow covered too. 1) Expect a mini, “sneaky” event tomorrow with potentially 4″+ accumulations in SE NJ, and possible for CNJ, NYC, and LI as well. But the safe call for now if 1-3″ (keep an open mind for higher). 2) Bigger event likely next week, with a track to the Lakes out of the question, a track offshore possible, and a track that impacts the mid/north atlantic in some way most probable. Accumulations could be significant, with the possibility of more, but will probably NOT reach anywhere near the magnitude of the DEC blizzard. 3) Frigid blast to encompass the nation for the heart of winter. Global regime supportive of colder than normal temps in the Northeast through the remainder of January.